An artist's conception of Triton and its binary companion as they approach Neptune. This encounter facilitated Triton’s capture to an inclined retrograde orbit around Neptune, an event that catastrophically altered the Neptune satellite system. Neptune's largest moon, Triton, was originally a member of a duo orbiting the Sun but was kidnapped during a close encounter with Neptune, a new model suggests. 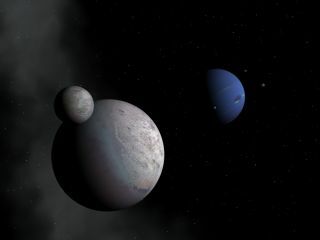 Triton is unique among large moons in that it orbits Neptune in a direction opposite to the planet's rotation, which long ago led scientists to speculate that the moon originally orbited the Sun. But until now, no convincing theory for how Triton paired with Neptune existed. Gravity might have pulled Triton away from its companion to make it an orbiting satellite of Neptune, researchers report in a new study published in the May 11 issue of journal Nature. "We've found a likely solution to the long-standing problem of how Triton arrived in its peculiar orbit," said Craig Agnor, a researcher from the University of California, Santa Cruz. "In addition, this mechanism introduces a new pathway for the capture of satellites by planets that may be relevant to other objects in the solar system." The new model predicts that Triton came from a binary setup much like Pluto and its moon, Charon. Binary systems can be pulled apart by gravitation when they encounter large planets like Neptune. The orbital motion of the binary system causes one member to move slower than the other, which can disrupt the system and permanently change the orbital companion. This mechanism, known as an exchange reaction, could have delivered Triton to any of a variety of different orbits around Neptune, Agnor said.